The Southeast Greenway Campaign Team is comprised of Campaign Committee members, who determine the Campaign’s overall goals and plans, a Circle of Advisors who bring special skills, active volunteers who help with community outreach, fundraising, and events, and over 2000 supporters. Please join our team! Bob Gaiser began his term as Co-Chair of the Southeast Greenway Campaign in January 2016. His work with the Campaign focuses on strategy and planning. Bob is a retired local government planner with 40 years experience with two cities and two counties. In his 26 years with Sonoma County, he helped develop policies for water, biotic resources, urban boundaries, geologic hazards, gravel mining, noise and stormwater. He lives with his wife in Santa Rosa and enjoys biking, photography, travel, making music, playing with his grandson, and helping manage a church. Thea is a 2011 Fellow of the Leadership Institute for Ecology and the Economy, was a Board member of the Sonoma County Forum, and enjoys spreading sunflowers all over Santa Rosa. Before retiring, she had a long career in sales with the Wrangler Jeans Company, taught school for five years, and was an employment recruiter in the biotech industry. She has a BS from State University of New York, Oneonta, a Masters in Education from NYU and an HR certificate from SRJC. Thea enjoys traveling with her adult daughter who teaches in the Bay Area, hiking, music and sharing all things food, wine and the arts with friends. Linda Proulx served as a Co-Chair of the Santa Rosa Southeast Greenway Campaign from 2009 – 2015. Linda enjoys working with the enthusiastic team of Greenway volunteers, focusing on strategy, communication, marketing and fundraising. Linda is a 2007 Fellow of the Leadership Institute for Ecology and the Economy, and, before retiring, was the founder and principal of Worklife & Learning, a career management and training firm. She holds a Masters Degree in Education and Counseling from Arizona State University and a Post-Masters Certificate in Adult Career Development from JFK University. The vision of a climate-smart urban Greenway with trails for walking and biking, community gathering places and gardens, and restoration of native habitat has captured Linda’s imagination. She likes hiking on local trails and looks forward to walking with her husband Alan and German Shepard Charlie on the Greenway! Jim McAdler has been involved with the Southeast Greenway Campaign since its beginning. As Campaign Treasurer, Jim uses his skills as a retired city administrator and CPA. Jim grew up on the Tuolumne River near Yosemite but now calls Santa Rosa his home. In his spare time, he chairs the local Cal Alumni scholarship program, and he has many hobbies including backpacking, skiing, guitar and travel. His most precious times are spent with his wife Sandy and their two children, Ryan and Marisa. The Greenway Campaign helps to nurture his love for open space and the great outdoors. Katharine has been a Senior Design Architect at numerous firms, including Hornberger+Worstell, Chong Partners, AXIA Architects, TLCD Architecture and SMWM Architects. She is currently developing project design, renderings and presentations as a consultant to a variety of architecture firms and is also an Instructor at the School of Landscape Architecture at Academy of Art. Katharine received her Masters of Architecture, Masters of Landscape Architecture and Bachelors of Architecture from the University of Pennsylvania. Katharine currently serves on the Santa Rosa Design Review Board having been a member since 2007, and on the Art in Public Places Committee. Katharine brings a professional eye and knowledge of the design needs of Santa Rosa to the Greenway Campaign, serves on a number of committees and adds business acumen to the fundraising team. The Campaign Committee also appreciates her contribution as recording secretary, taking notes at meetings and keeping the group on track. She lives in Santa Rosa with her husband Randy. They enjoy hiking in Santa Rosa and the regional parks and traveling when their schedules permit. In addition to her work as Southeast Greenway Campaign Secretary, Grace works with the Marketing Communication and Fundraising Teams. She designs the Greenway Campaign’s eNews, generally oversees the management of the information database, and is the Greenway’s volunteer official photographer. Born and raised in Hong Kong, she holds degrees in geography, music, education, and business management in four different universities in Hong Kong, Canada, and the US. After retiring from her music and arts management careers, Grace pursued her childhood interest in photography and in free-lancing and volunteering for charity organizations such as Catholic Charities, Peace and Justice Center, Community Child Care Council, and North Coast Mac Users Group. Grace is an animal lover and is into organic gardening, water and energy conservation. She sees the Southeast Greenway as a once-in-a-lifetime opportunity for citizen involvement in planning a Greenway for the benefit of the entire community. Peter is a geologist with 25 years of consulting experience. Environment Assessment has been the primary focus of Peter’s education and work. He has managed numerous site assessments and investigations including wetlands assessments, biological monitoring, archeological surveys, and hundreds of Phase I and Phase II environmental site investigations. Peter is a California Professional Geologist with a B.S. in geology and a minor in biology. He brings to his work a passion for natural history as well as a practical understanding of historic agricultural and industrial land use practices. Peter assists the Greenway Campaign with Geographical Information Systems (GIS) mapping and analysis. He is passionately interested in bike transportation and is delighted that the Greenway will strengthen our local and regional network of trails. He and his family raise puppies for Canine Companions for Independence. They are currently raising their third puppy, Henderson. Jenny Downing’s work with the Southeast Greenway Campaign focuses on database management. During her corporate career, Jenny was a project leader/liaison working with corporate contract clients, accounting clients, and computer programmers. Her efforts went toward designing database systems. At Oregon State University, Jenny’s undergraduate studies focused on fashion retailing, with a minor in business. She went on to earn an MBA at Golden Gate University. Alexa is an outreach team member for the Southeast Greenway Campaign and enjoys spreading the word about this unique opportunity for our community. Alexa works at SRJC as a professor of environmental philosophy. She is excited about the Greenway for many reasons. As a mother of young, active children, she is enthusiastic about the possibility of delivering her kids to their nearby schools and activities along a route that is safe and beautiful. As a professional who studies the various ways that development is threatened by environmental limits, she sees this as an opportunity for our community to pursue alternative models of development that incorporate people, businesses, nature, and public venues into dynamic and livable spaces. Finally, as a cyclist, she believes the Greenway will be a much-needed addition to our regional network of trails. Philip brings design and planning expertise toward the concept and future development of the Southeast Greenway. Philip holds a Masters Degree in Landscape Architecture from the Graduate School of Design at Harvard University. As a landscape architect he has been involved regionally, nationally, and internationally with community design over the past 30 years. Philip’s experience with project entitlement, land development, design process, along with a good understanding of natural systems and landscape construction practices, will help enable the realization of the Greenway. Trains, planes, cars, bikes, sailboats, horse, on foot – Philip loves to travel and experience different cultures. Vin’s work with the Southeast Greenway Campaign focuses on bicycle and pedestrian use of the Greenway. Vincent is a Professor Emeritus of Chemistry from Sonoma State University where he taught from 1969-2002. His education includes a BA in chemistry from Wesleyan University in Middletown, Conn. and a PhD in biochemistry from Florida State University in Tallahassee. Vincent’s community involvement inclues being the 3rd Supervisorial District member of the Sonoma County Bicycle and Pedestrian Advisory Committee; a long time member of the Sonoma County Bicycle Coalition and the Santa Rosa Cycling Club; founding president of the Diabetes Society of Sonoma County; Chairman of the Clo’s Classic Bike Rides for the Diabetes Society; and tutoring chemistry at Petaluma High School. Vin’s main vision for the Southeast Greenway is to have a bicycle/pedestrian path which will eventually link Spring Lake Park with downtown Santa Rosa and the west county. Tanya has been involved in the Southeast Greenway Campaign since its launch, first as its fiscal sponsor in her former role as Executive Director of the Leadership Institute for Ecology and the Economy, and currently as a member of its Campaign Committee. She has over 20 years of leadership and management experience in the fields of technology, sustainability, and community engagement. Tanya holds a bachelor’s degree in electrical engineering, an MBA, and is currently working on her master’s degree in Urban and Regional Planning. Tanya loves running the trails in Spring Lake and Annadel. She looks forward to the day when she can run from her house in west Santa Rosa to Spring Lake via the Santa Rosa Creek and future Southeast Greenway trails. That’s what Janice Nicholson felt when she first became aware of the Southeast Greenway. Janice, her husband and two canine kids live within walking distance of the future Greenway. They have been really impressed with how effective the Campaign Committee has been in promoting the Greenway vision, and with the progress being made. Janice finally joined the Greenway team in 2016 after retiring. Her background includes 25 years at HP/Agilent as a finance analyst and database administrator, and another 12 years at the Sonoma Humane Society managing its donor database and assisting the Development Director. Janice has been pleased and proud to help the Greenway Campaign with their administrative, database and fundraising work. David’s work with the Southeast Greenway Campaign focuses on land use planning, community outreach, and the Greenway’s immense eco-tourism potential. David’s career includes various pursuits related to land use sustainability, including current employment with the county’s largest environmental advocacy group, and past employment involving municipal, regional and resort land use planning. His previous experience also includes reporting on land use/economic development issues in eco-tourism pioneer Costa Rica, his wife’s homeland. David’s education background includes an MPA (with a Community Development emphasis), and current involvement with the Congress of New Urbanism. David’s is excited about the Greenway’s potential to provide the key missing link for an emerging pedestrian/bike/wildlife/biological corridor connecting the Sonoma Valley and the historic town of Sonoma with the confluence of the Russian River and Pacific Ocean. Alan’s work with the Southeast Greenway Campaign focuses on fundraising and community outreach. He has helped secure several grants for the Campaign through his proposal writing. Currently, he is on the Board of Directors/Trustees for Yulupa Cohousing and for the Unitarian Universalist Congregation, Santa Rosa. Alan retired after a 35-year career in hospital and health care planning and marketing. He holds a BA from the University of Connecticut in Zoology, and an MBA from Missouri University. Alan is a rock hound, and enjoys tennis, hiking, travel, kayaking, gardening, and reading. Alan says he is excited about the Greenway because of what it will give to the community in terms of improved land use and what it will offer children and young people – recreational activities, education and community building experiences. Renee’s work with the Southeast Greenway Campaign focuses on the fundraising committee and on coordinating outreach efforts. Her other community involvements include the Neighborhood Alliance of Santa Rosa, and Santa Rosa Together. Before retiring, her professional experience involved parks, recreation, urban planning, outreach, public involvement and participation, and project coordination. She holds a BS from the University of California, Berkeley. Renee moved to Santa Rosa from Dallas six years ago to be close to her daughter and two grandchildren who live in Cotati. Marina works with the Marketing Communication team for the Greenway Campaign and brings expertise in strategic planning, branding and website development to the effort. She is the Marketing Director for TLCD Architecture in Santa Rosa, and enjoys the blending of community projects the firm is involved with and her commitment to this grass roots organization. Originally from Southern California, Marina has lived in Sonoma County for the last 28 years with her husband and two children. She holds a degree in Advertising Graphics from Cal State Northridge and is involved with continuing education in Social Media. Marina loves the outdoors, gardening, hiking and travel. When this Greenway is completed, she said she will be the first person signed up to organize a community garden! Linda’s work with the Southeast Greenway Campaign focuses on administrative tasks and databases. Linda moved to Santa Rosa from Anaheim, CA with her husband Jim in 2004, as new retirees. Initially, she volunteered with Bird Rescue and took Wine Studies classes at SRJC. Later, she worked for LandPaths as a volunteer in 2006, and then again as a part time employee from 2007 until 2013. Biologist Steve Barnhart has lived within a block of the Greenway since 1970. Steve’s research specialty is oaks and oak vegetation, so he was pleased to say “yes” when asked to serve as an advisor to the Southeast Greenway Campaign. Steve is a champion of natural habitat restoration to the Greenway and has done biological surveys and written background papers to explain the Greenway’s rich potential. After receiving his BA in biology at UC Riverside and his MS in Plant Ecology at San Diego State University, Steve spent 41 years as a college professor, 37 at Santa Rosa Junior College (SRJC), where he taught biology, botany and ecology. He has also consulted with local state and regional parks on vegetation management and restoration issues. Mitch got involved with the Southeast Greenway Campaign via his association with the American Institute of Architects (AIA). A few years back, the Campaign asked for assistance from the AIA’s “Communities by Design – Sustainable Design Assessment Team” (SDAT), so Mitch volunteered to help. Currently, Mitch acts as an advisor-at-large, architect/community planner attending SEG meetings and consulting with its leaders. What excites Mitch about the Greenway is its key role as part of an east/west hike and bike connection system. Mitch was born in Detroit and moved with his family to Anaheim, California in 1960. He attended Montana State University, earning his Bachelor of Architecture degree, and was involved in several graduate programs. He has been a licensed architect in California since 1979 and a Sonoma county resident for about 35 years. Mitch and his wife Michelle Gervais are the parents of seven year old twins, Clara and Benjamin. He says his young brood keeps him on full alert! As a member of the Circle of Advisors, Stephen is active in marketing communications, fundraising and environmental assessment for the Southeast Greenway Campaign. During the day, he is the Vice-President of eCommerce for Real Goods, dividing his time between Hopland and his home office two blocks from the Southeast Greenway. Stephen co-founded the Sonoma County Water Coalition and was named the Environmentalist of the Year for 2014 by the Sonoma County Conservation Council and the Sierra Club Sonoma County Group. As an avid cyclist, he enjoys riding his bike to most meetings he attends. Born in England, Stephen is a graduate of Cambridge University where he majored in 8th century Chinese poetry. He is excited by the Southeast Greenway because he considers it to be one of the most effective ways he can contribute to our community response to climate change. Wendy has been involved in the Southeast Greenway Campaign since its early discussions, and is currently active in its Circle of Advisors. She has been professionally involved in farming/gardening management and education since 1978. She is adjunct faculty in Sustainable Agriculture at SRJC (Santa Rosa Jr. College), and was coordinator for SRJC’s Shone Farm production market garden and orchards from 2000 – 2007. In addition, she is a volunteer member of several agricultural and environmental organizations. Wendy is interested in the Southeast Greenway’s potential for (1) community gardens, (2) farming opportunities at the historic walnut orchard, (3) habitat restoration, and (4) creation of non-motorized community linkage. Wendy loves gardening, hiking, native plants, being involved with community, and music. Steve Rabinowitsh’s work with the Southeast Greenway Campaign involves strategy and coordination with local government agencies. Steve has been teaching Political Science at SRJC since 1987. He has Masters Degrees in Political Science and Urban and Regional Planning from the University of Colorado. Steve currently serves on the SMART Citizens Oversight Committee, Sonoma County Agricultural Preservation and Open Space District Advisory Committee, the Sonoma County Community Foundation Board and is Chairman of the Santa Rosa Waterways Advisory Committee. Steve served on the Santa Rosa City Council and the Executive Board of the Association of Bay Area Governments from 1998-2006. He helped organize community support for the Prince Memorial Greenway, and was also involved in promoting creek restoration, bikeways, affordable housing, open space protection and public art. Kristin Thigpen has served on the Southeast Greenway Campaign’s Economic Development, Programs and Outreach Teams. She has focused on introducing the SE Greenway to local schools, reaching out to administrators and principals. Kristen has over 25 years of experience in marketing and program management, and is the owner of Thigpen Marketing & Project Management, a consulting firm in Santa Rosa, CA. Her community involvement includes: First District appointee to Sonoma County Agricultural Preservation and Open Space Citizens Advisory Committee; Chair, Sonoma County Regional Parks Foundation Board; and the Sonoma County Regional Climate Protection Authority Climate Action 2020 Stakeholders Advisory Group. Mac Freeman has been an active volunteer in the Southeast Greenway Campaign since 2014, writing bios for the campaign website. Mac has over 20 years of technical writing experience. Mac holds a bachelor’s degree in horticulture, and an AS degree in electronics technology. He is retired after working 26 years at HP/Agilent Technologies. Mac has lived in Sonoma County for over 35 years, and loves hiking the trails in Spring Lake and Annadel. He spends much of his free time playing guitar and gardening at his home in Santa Rosa. Mac is excited to imagine walking the Southeast Greenway trails with his wife and dog, and watching the renewal of the old walnut orchard! Linda is the Greenway Webmaster. She works closely with the MarCom committee to make sure accurate information about the Greenway is available to the community. For the past year, her primary focus has been the redesign of the site. Implementing the stunning design developed by Marina Starkey has been a wonderful way to keep current with Web technologies and contribute to a worthwhile cause. Linda has worked at Santa Rosa Junior College since 1988. She is an instructor in the Computer Studies department where she coordinates the the Web Development program. It has been a privilege to work at this “community treasure”, but she is looking forward to retiring in Jan of 2016. She is a neighbor of the Greenway and hopes to walk her dog Maverick from their home near Montgomery Village, all the way to Spring Lake. After taking a lap around the lake she is pretty sure she and Maverick will both need a nap. Marie Piazza’s work with the Southeast Greenway Campaign includes acting as a representative at various community events and participating in the annual Phone-a-Thon. She has served as facilitator for the Campaign’s Critters, Creeks and Garden Working Group. A Licensed Marriage and Family Therapist in private practice for nearly twenty-five years, Marie also works as a Medical Social Worker for Memorial Hospice, bringing her expertise and compassion to help those in our community facing the end of life. Marie has lived adjacent to a section of the Greenway since 2005 at Yulupa Cohousing, where she uses her interpersonal skills in a variety of community building activities. An avid advocate for all living things, Marie feels honored to be part of the exciting and vibrant Southeast Greenway Campaign. She just can’t wait to harvest fresh strawberries from the Greenway’s community gardens and take her grandkids on Greenway bike trips to Spring Lake! Rick has been an active member of the Southeast Greenway Campaign for the past three years. His volunteer activities include fundraising, education and outreach, helping produce community forums and joining hikes to introduce the property to community members. Rick’s interests include bicycle riding, photography, and cooking. He has enjoyed a burst of travel since retiring, but always enjoys the trip home to our wonderful area. Dorothy puts her talents to work with the Campaign’s community outreach efforts. Dorothy worked in the Bay Area as a body therapist – Rolfer – both as a structural and movement practitioner for twenty-five years. She closed her professional career in 2002 and turned her attention to art, which has been a deep and continuous thread throughout her life. Tony’s work with the Southeast Greenway Campaign focuses on article writing and community outreach. Tony is a Professor Emeritus in History from Sonoma State University where he taught Latin American History and Global Studies for 37 years. He has a BA in History from Stanford, an M.B.A. from UC Berkeley and a Ph.D. in History from UCLA. He is also the author of Siqueiros, Biography of a Revolutionary Artist. Since retiring, Tony has taught courses in the Lifelong Learning programs at SSU and Dominican University and organized five group trips to Cuba. He is also active in the North Bay Organizing Project, the North Bay Jobs for Justice and volunteers at the Redwood Empire Food Bank. Friend and Greenway Campaign Committee member Jack Macy died on August 2, 2017. Jack, a civil engineer by training, brought expertise in infrastructure, public works and development projects to the Greenway effort. Jack was personable and great to work with. Whether the task involved planning, presenting to City Council, or storing T-Shirts in his garage, he was always willing to pitch in. In addition to the Greenway, Jack was deeply involved in the community, volunteering with the Santa Rosa Chamber, Catholic Charities, the Santa Rosa Design Review Board, the Prince Memorial Greenway and Joe Rodota Trail. We will miss Jack’s “can do” attitude and dry sense of humor. 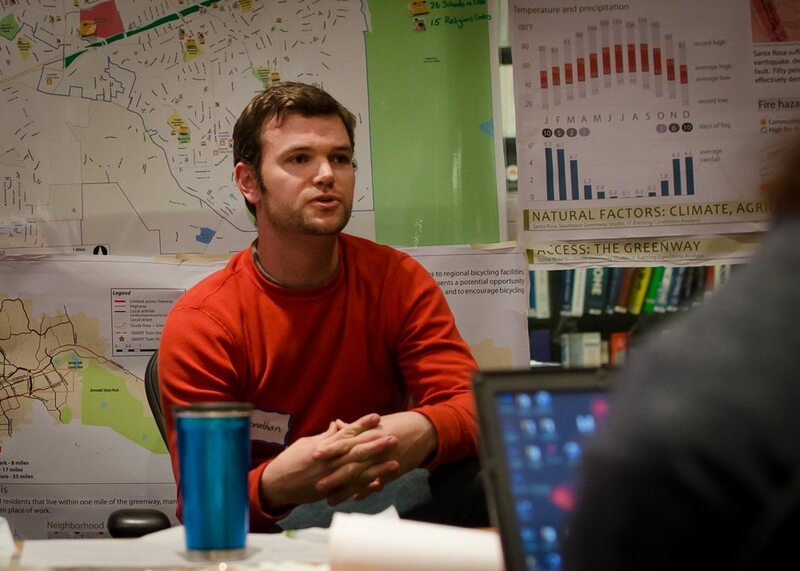 The Southeast Greenway Campaign Committee suffered a profound loss with the passing of Jonathan Glass in 2013. With a backpack slung over his shoulder and a floppy brimmed hat perched on his head, Jonathan Glass was the pied piper of trail walks for the Southeast Greenway. Jonathan’s love of the great outdoors and search for natural play environments for his daughter Eden in his neighborhood prompted him to join the Southeast Greenway Campaign as a founding member. For 5 years Jonathan was a tireless advocate for sensible stewardship of the Greenway land. His expertise as the Field Programs Director at LandPaths and environmental science scholarship brought information, advocacy, and voice to our vision. His colleagues, friends and acquaintances can attest to the many contributions Jonathan has made at all of the organizations he was affiliated with, including Santa Rosa High School, UC Davis, LandPaths, Young Democrats, the Southeast Greenway Campaign, the City of Santa Rosa, the County of Sonoma, the Leadership Institute for Ecology and the Economy, and many non-profits. All will miss him. The Campaign will continue to do his work and honor his vision of a Greenway to Spring Lake – a place where children can play and where all can enjoy our beautiful outdoor spaces.